If you want to save money on real food, it’s important that you evaluate where you’re shopping. You can’t just assume that one store has better deals than another. You have to do the leg work – make a list, get in the store and pull out the calculator. I’ve done the leg work for you in the past, with comparing Costco and ALDI, and then again comparing ALDI to Walmart to see which was cheaper. This time, I wanted to put two health food stores to the test and see which was cheaper, Trader Joe’s or Whole Foods. I recently wrote this Trader Joe’s Shopping Guide, which covers everything you could possibly want to know about grocery shopping at Trader Joe’s. 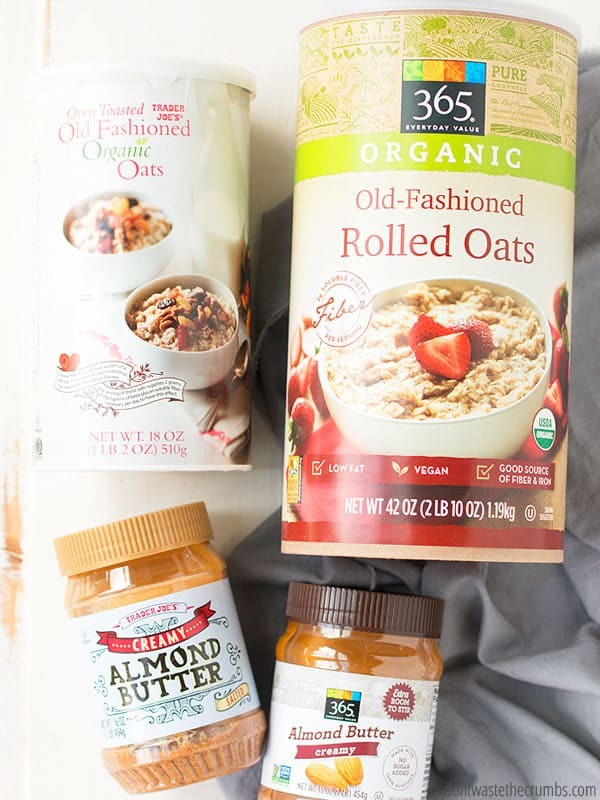 Definitely read that article if you’re interested in making Trader Joe’s one of your regular grocery stops (which you might consider, after you read this price comparison!). 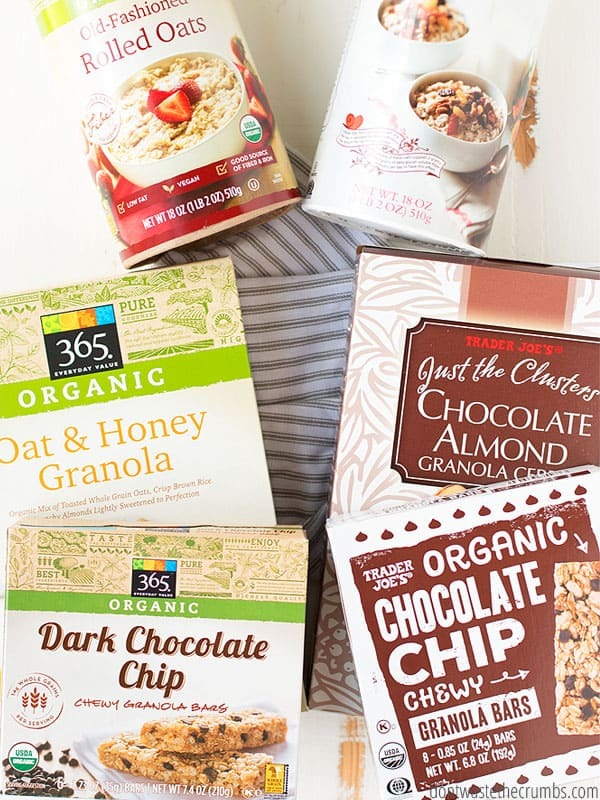 A few years ago I shared some of the best healthy foods you can buy from Trader Joe’s. Many of which hit today’s list too! For the purpose of this post, here are a few reasons why you would consider, or why you would NOT consider, shopping at both Trader Joe’s and Whole Foods. You save on the house brand. The large majority of items at Trader Joe’s are house brand, which means you can save a lot of money over buying name brand products. You have a limited selection. This is a good thing, because you’re not going to spend hours upon hours choosing between 15 different types of salsas. There’s maybe 3-4 max, and that’s the exception. Most items only have one or two varieties to choose from. For a lot of people, this makes grocery shopping much faster and easier. They don’t carry everything. 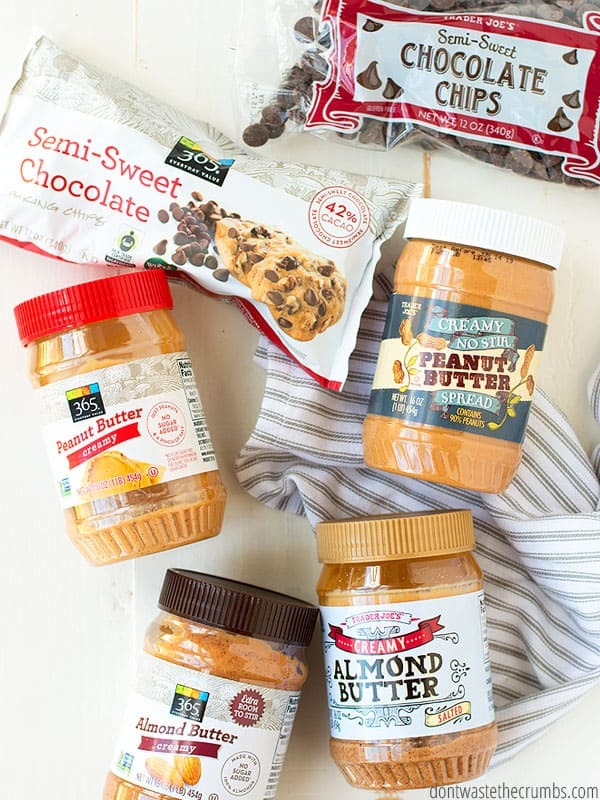 As I mentioned in this article, Trader Joe’s carries a lot of uniquely flavored items. That’s fun and all, but if you’re looking for “regular” foods, you might have to make a second stop somewhere else to pick them up. There’s a lot of organic items. If you’re seriously concerned about buying organic food, I would encourage you to first read this research article I wrote about the organic industry. If your mind is still made up, Whole Foods has a great selection of organic foods. In fact, many of the foods on their shelves are offered only as organic. There are a lot of allergy-friendly options. The fact that there were allergy-friendly options all over the store is what impressed me the most. We’ve been dealing with food allergies ever since we finished the Whole30, and it hasn’t always been easy. Cooking from scratch makes it easier of course, but it was really nice to be able to walk into Whole Foods and find convenience foods that were allergy friendly as well. Psst! 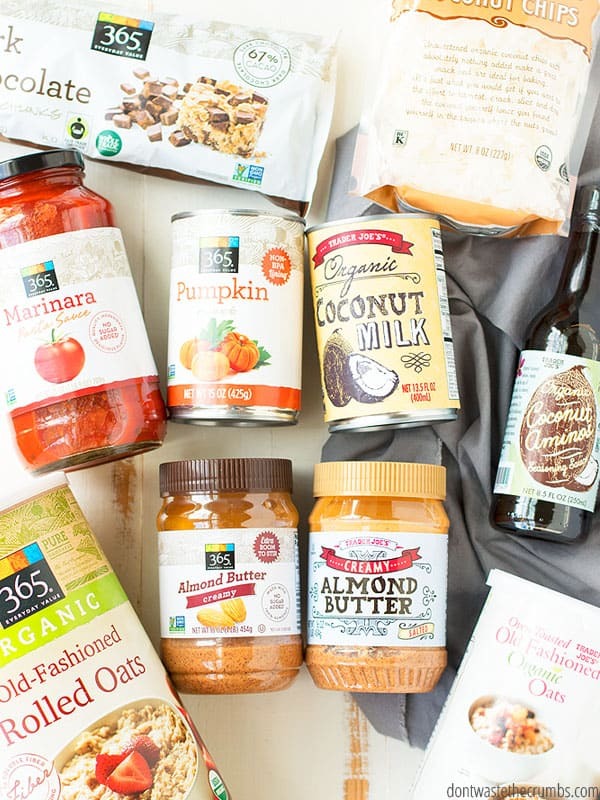 If you’re going to Whole Foods, here are the top 11 things you should buy from there. Your quality is limited. Whole foods has a lot of organic foods, but what if you don’t want to buy organic? If you’re shopping according to the Dirty Dozen and Clean Fifteen, you’re going to buy a lot of things conventional… the problem is, Whole Foods doesn’t offer conventional for many items. In this case, you can’t even choose a lesser quality and by default, forced to pay higher prices for quality you didn’t necessarily want. Your selection CAN be limited. I found that in some sections, Whole Foods had a lot of options to choose from. There were plenty of chips, kombucha and breakfast options to choose from. At the same time, there was only one brand of ground beef, the only cut of pork was pork chops and there weren’t any chicken legs. Depending on what you’re looking for, you might be disappointed in what Whole Foods has to offer. 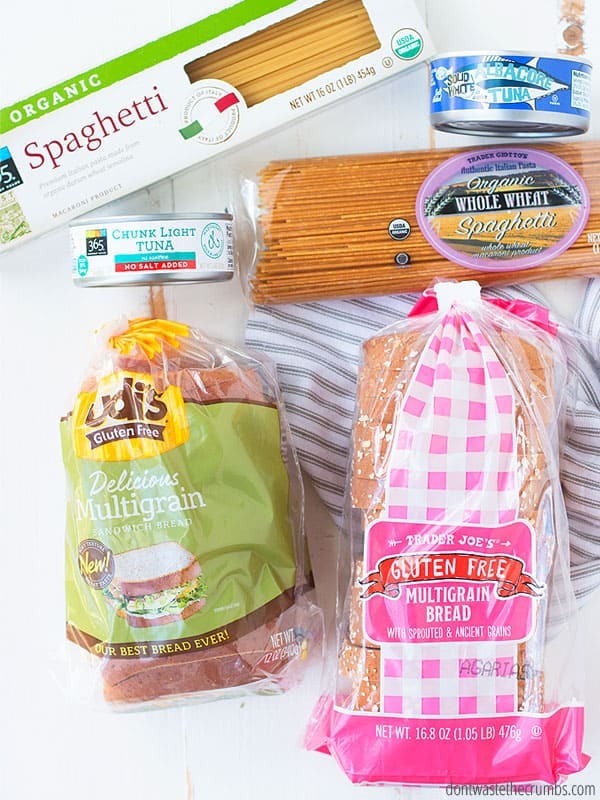 Which is cheaper, Trader Joe’s or Whole Foods? The Rules. 1. Compare items I purchase the most often. Like you, there are a handful of items that I purchase every single month, over and over again. I took my own list, plus a few things that I thought the typical frugal foodie would buy too, and made that my shopping list for both stores. 2. Staples items, across the board. Prices will vary greatly from region to region, and from season to season, so I tried to stay away from too many items that would have wide swings in prices (like strawberries or blueberries or watermelon). Instead, I focused on the staple items that we’d buy year-round anyway. That way the results from this comparison will be valid both now and later. The prices below are taken as of 8/31/2018, are from the Atlanta, Georgia area and should be used as a guideline only. You may or may not find the exact prices in your area, so do your homework before you commit to one store or another. If the prices in your area are different, I’d love to hear them in the comments!! 4. Use the lowest price per unit. Some items are offered in ounces, some in pounds… some come in one pound in one store, but come in two pounds in another store. I broke it down to the lowest price per unit that is common between both items. 5. Use the cheapest brand whenever possible. By design, Trader Joe’s carries very little mainstream brand items. On the other hand, Whole Foods carries only some house brands. That meant comparing “apples to apples” difficult. My work around was to choose the cheapest brand for each store respectively, whether that meant a national brand or the store brand. 6. Compare like items to like items. 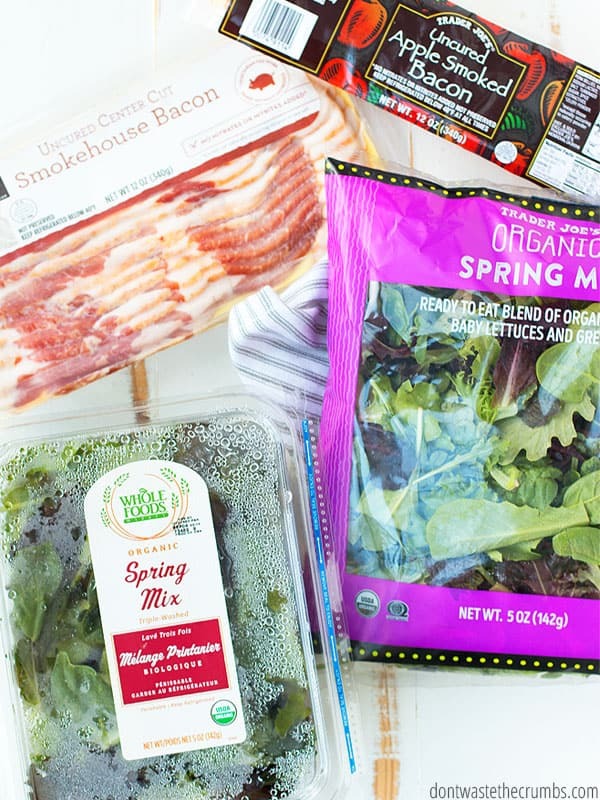 Both Trader Joe’s and Whole Foods seem to think alike when it comes to organic and conventional, so it was relatively easy to compare the same quality of foods between the two stores. I’ve noted whether the prices are for organic items or conventional items when there is a difference. If the quality isn’t noted, then the item is conventional. There was only one, maybe two exceptions to comparing the same quality from both stores, and those are notated in the break downs below. * The average banana weighs 0.40 lbs. What surprised me the most when comparing Trader Joe’s vs. Whole Foods? I was surprised to find Whole Foods the winner on a few things that are typically expensive, like chicken breasts and olive oil and turbinado sugar. I was also surprised to see a very big price difference in a few things, like a $5 difference in honey or a $9 difference in coffee. It was also surprising to see a handful of items where the prices were exactly the same! At the same time, I found it very interesting that as a general rule of thumb, Whole Foods costs about $1 more for every time. 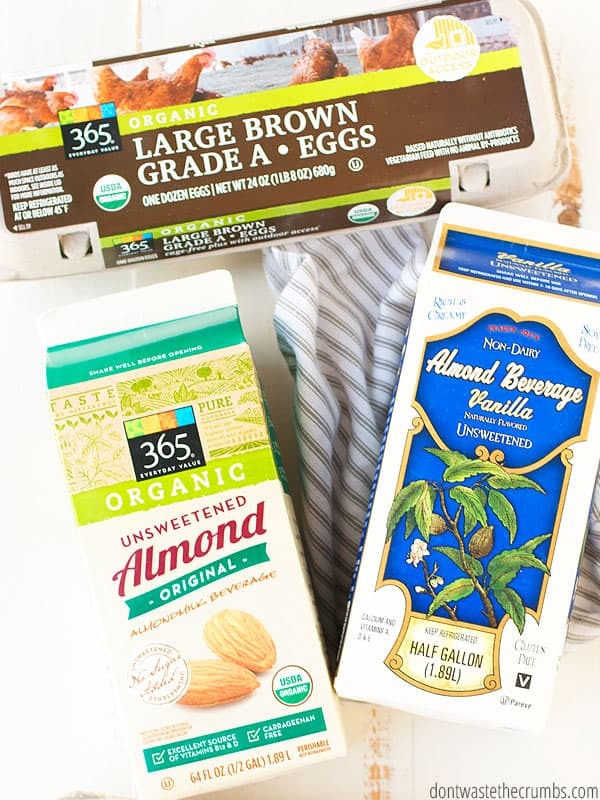 Yes, some things aren’t quite that much more (like Almond Milk is only 30¢ more at Whole Foods) and the difference in price is higher for some things (like wild-caught salmon costs $2.51/lb more at Whole Foods). However, if you were to shop the above grocery list at both Trader Joe’s and Whole Foods, you’d spend nearly $100 more at Whole Foods… for the EXACT same foods! One of the keys to saving money is paying attention to every dollar you spend, and I feel it’s safe to say that if you shop at Whole Foods, it’s wise to make sure you’re only buying those things that Whole Foods wins out on price. Otherwise you’re easily spending more money than you need to and those dollars will add up quickly! 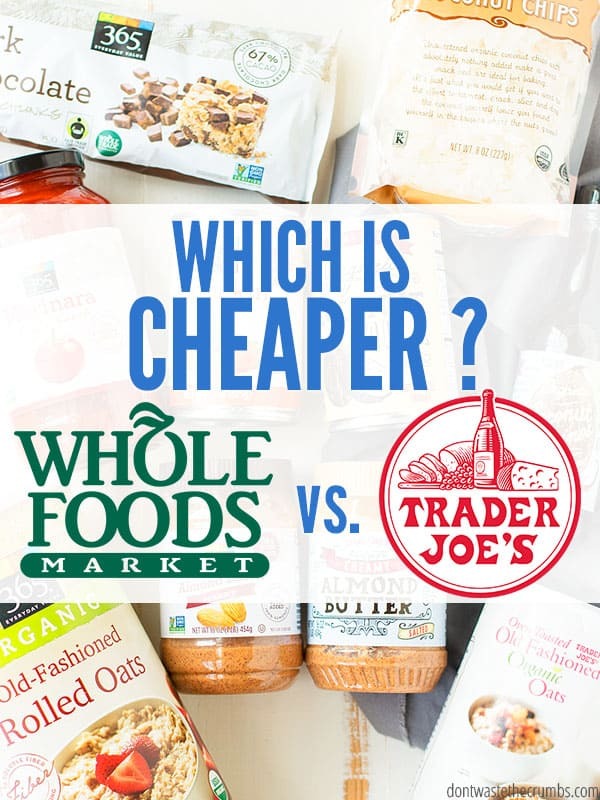 Which did you think was cheaper, Trader Joe’s or Whole Foods? Are you surprised by these findings? Share your thoughts in the comments below!